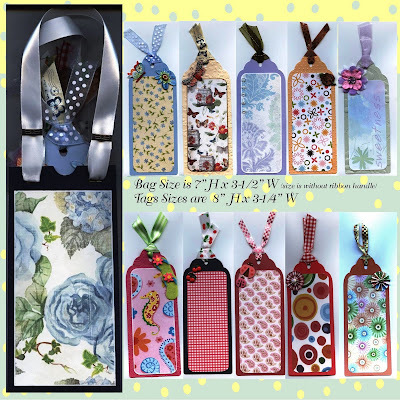 As you can see I have been really busy with this Project but it is a wonderful selection of oversized tags with 3d embellishments on each tag and has beautiful organza and satin ribbons too. The bag measures 7-1/2" high by 3-1/2" wide and each tag measures 8" high x 3-1/4" wide. Plenty of room for you to write your own sentiment or these could also be used as bookmarks or combine them with the binder ring I will include with this set and turn it into a tag mini album. Its up to you ! There are 10 Tags in all so could use part of them as a mini album and part of them as tags or bookmarks. Have fun deciding. And for those of you who do alot of scraping this was a wonder way to use up some of my scrap stash too!